I know this dish sounds like something you would only cook in the depths of winter, and it would certainly hit the spot if you did, but the flavours are actually very subtle and delicate, making it perfect for warmer weather too. I cook this dish regularly and it’s one of those meals that’s both impressive and comforting at the same time – great for entertaining but just as good as a simple meal for the family. Gremolata which is an Italian herb mixture of finely chopped parsley, garlic and lemon zest really perks up all the flavours and adds a lovely fresh finish, which again aids in making this a dish for all seasons. In winter we pair it with a nice glass of Cab Sav and some crusty bread but on warmer days a crisp white wine and a green salad transforms it to an even lighter meal. The lamb cut that is best suited for this recipe is lamb neck chops, which are incredibly inexpensive and like all secondary cuts need long slow braising, but boy is it worth it. Neck chops can sometimes be hard to come by and if I can’t source any I substitute bone in shoulder chops which also work well. Basically you need a cut that can stand up to a long braise, preferably with bones as this adds a lot of flavour and keeps the meat moist. 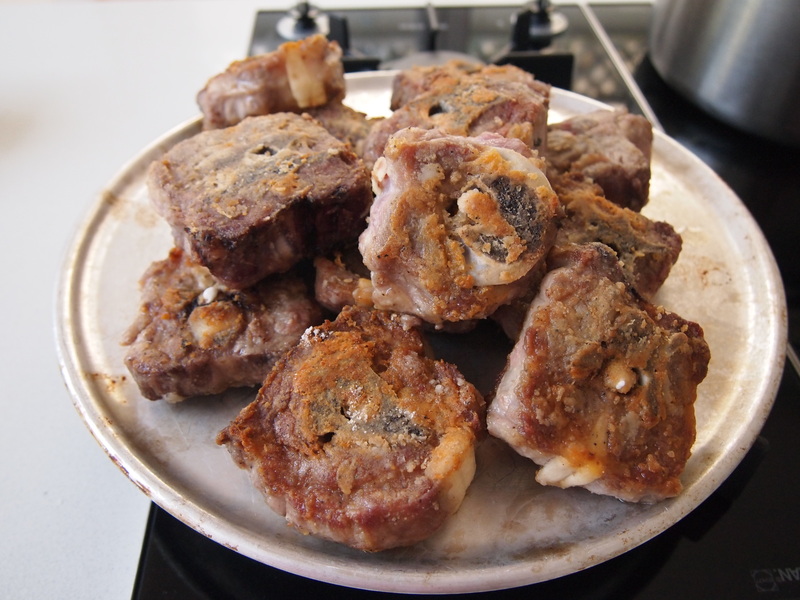 1.2kg lamb neck chops – see note above. If you’re substituting shoulder chops you won’t need as much as they are more meaty than neck chops. Preheat oven to 180C. Season the lamb well with salt and paper. Place the flour in a bowl or plastic bag, add the lamb chops and toss to evenly coat. Heat 3 tablespoons of oil in a large frypan over medium-high heat. Shake excess flour off the lamb, then cook in batches for 2-3 minutes per side until golden. Remove from the pan and set aside. Wipe the pan clean with a paper towel and place over medium heat. 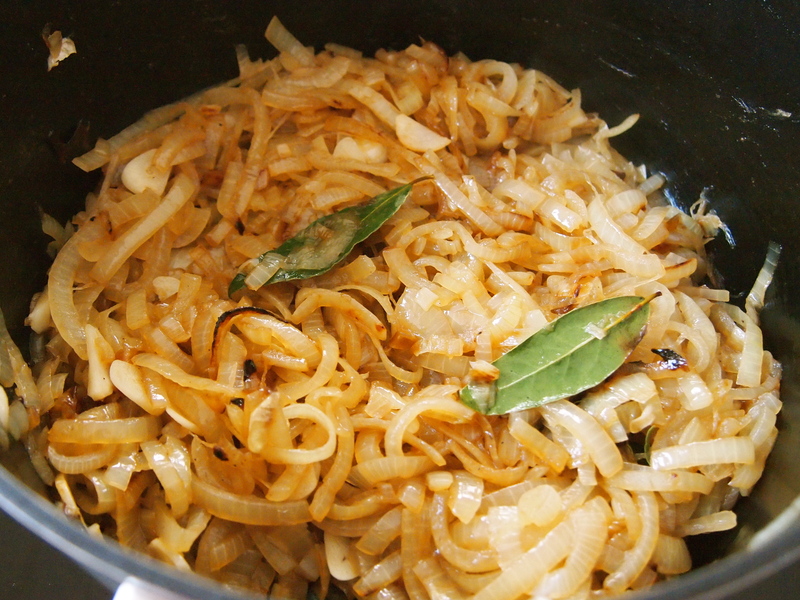 Add another 4 tablespoons of oil and the onions, along with a large pinch of salt, and cook, stirring for about 15 minutes or until golden brown. Add the garlic and bay leaves and cook for a further 3 minutes. Place the lamb in a flameproof casserole then top with the onion mixture. Toss the potatoes with the melted butter and thyme and season with salt and pepper. 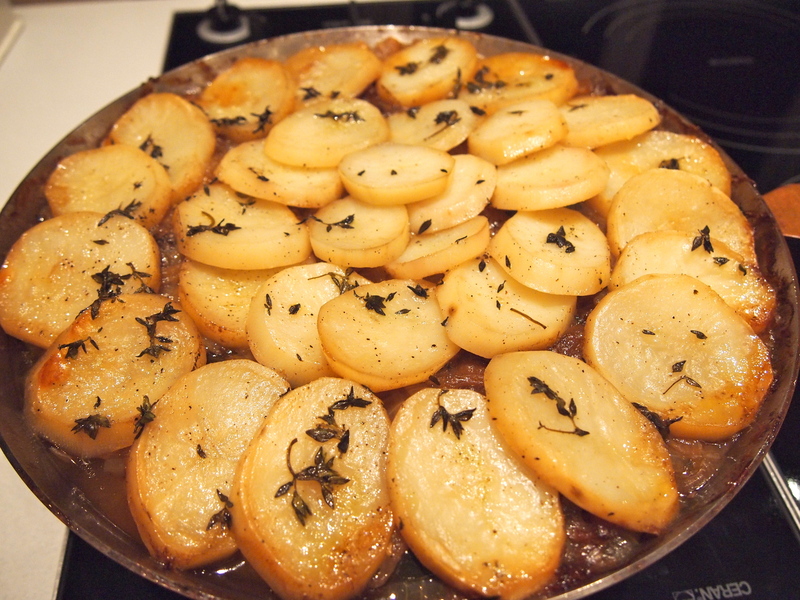 Arrange potatoes over the top of the onions in a circular pattern, overlapping slightly. Pour the stock in and around the potatoes then cover the casserole dish with a lid or some foil. Place the dish in the oven and bake for 30 minutes. Then reduce the oven temperature to 130C and cook for a further 2½ hours or until the potatoes and meat are tender and the sauce has thickened. Remove the lid/foil and switch the oven to the grill function. Grill on high heat for a few minutes or until the potatoes are golden. 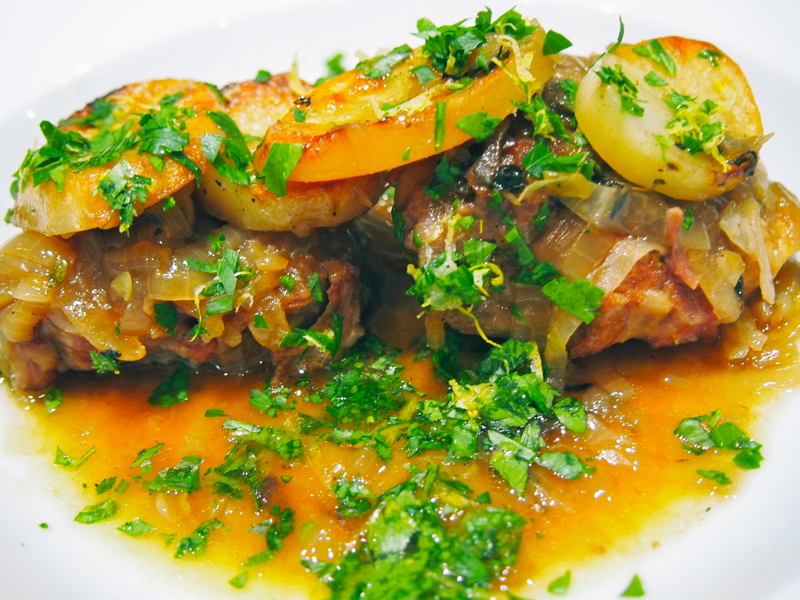 Remove the lamb from the oven and let it rest while you make the gremolata. For the gremolata, place all the ingredients in a bowl and stir to combine well. 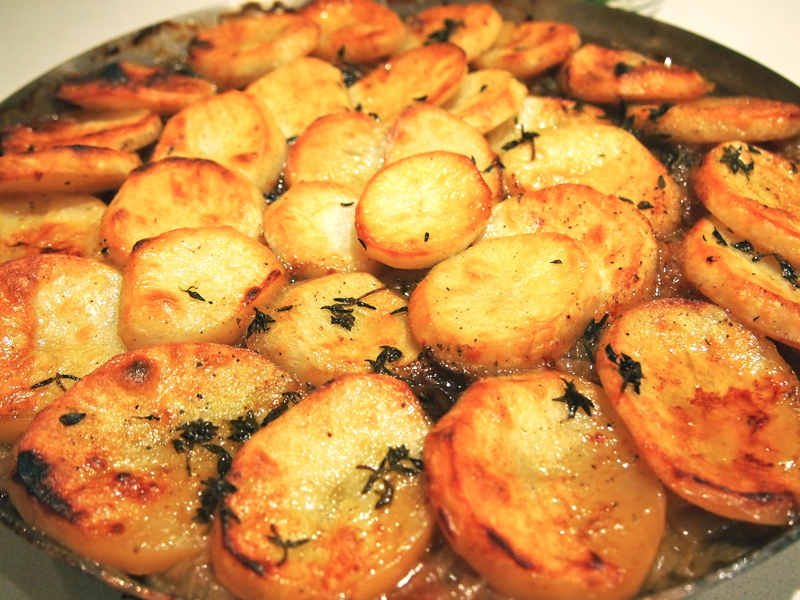 To serve, divide the hotpot among plates or bowls and sprinkle with the gremolata.